The dual meaning of the phrase and the punctuation give it a little edge. It's also short, memorable, and relatively obvious. I'm not sure how many young folks know what time cards are anymore, but I wanted to use a more iconic image, rather than one that presumes a particular occupation (e.g. a desktop). 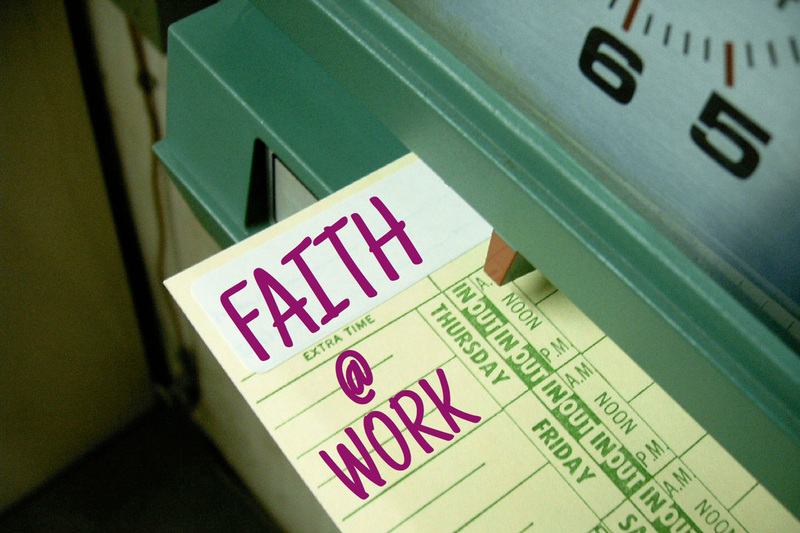 My intention is to do a series that really just introduces the broad topic of the spirituality of work. Any one of the subtopics could support its own series, but we're not used to hearing many specifics about work in preaching at all. This series can draw from Pope John Paul II's extensive teaching on the spirituality of work, Catholic social teaching, U.S. Bishop statements, and many Catholic and Christian authors who focus on this topic. It's hard to get things started up in the Fall, especially small faith-sharing groups. The later start date makes it much more likely that we can engage other parishes. These seem to be the best weeks based on connections with the Sunday lectionary readings. Overlapping with Labor Day would have been nice in theory, but many are away for a long weekend. These are all proposals, and not firm. Input welcome! The Gospel story is of the two sons who are asked by their father to work in the vineyard (one refuses but then goes, the other agrees and doesn't). This is an entry point for discussing how we need to competently carry out the work we have committed to doing. The second reading, from Philippians, challenges us to humility in Christ and looking out for others' interests. The Gospel story is the parable of the tenants, where the landowner's servants and son are murdered by the tenants. This offers an entry point for considering the treatment of workers everywhere. The story can serve as a reminder that Jesus is present in workers, especially the "least of these." How do we work for God's kingdom and the good of all? The Philippians reading tells us to focus on whatever is true, just, pure, lovely, gracious, excellent, and worthy of praise. While work itself is not bad, it can become unhealthy and take over our lives. This is an age-old problem and one of the reason the sabbath is part of our tradition. This is a particularly difficult problem today, with always-on communication, crazy work expectations, rejected vacation time, lack of paid family leave, etc. As Lily Tomlin famously put it, even if you win the rat race, you're still a rat. The drive to over-invest ourselves into work begs the question, "What is success?" The Gospel is of a wedding banquet where invitations are ignored by some, who instead decide to work! This is an obvious entry point for considering how our work can get in the way of the joy of the Gospel, however we experience it. In Philippians, Paul tells how he has learned to live in abundance and humble circumstances. He did not seek affluence at all costs. The first reading from Isaiah tells of abundance from God. This could be an opportunity to connect with Old Testament accounts of how God provided abundance that would last through the Sabbath (Exodus). In the Gospel, Jesus tells us to give to Caesar what belongs to Caesar and to God what belongs to God. One way to read this is as an affirmation of our social responsibility. We may see our job as a Caesar ruling our decisions at times, but what responsibility do we have to God to improve that work system? Do we treat others with honesty and dignity? Do we offer thanksgiving and congratulations? Do we act ethically? In the Gospel, Jesus tells us to love God and neighbor. What does it mean to love our neighbor in the workplace? The first reading from Exodus includes exhortations to not take advantage of the weak. Our primary recommendation is Gregory Pierce's Finding God@Work, published by Renew International. It follows closely to the topics covered in this series. This can work well for anyone in a traditional job. We are actively looking at adapting William Droel's out-of-print "Spirituality of Work" booklets into eResources for small group use. There is one for homemakers, teachers, lawyers, nurses, and business people. The specificity of these options can be a game-changer in getting people to commit to joining a group and even inviting non-parishioners to join a group. Gregory Pierce's Spirituality@Work is also particularly recommended, with topics correlating with the series.